This 6-ingredient winter kale salad is sweet & salty, crunchy & crisp, and it's doused in a delicious gingery dressing. Make it for an easy weekday lunch! All you want for Christmas is a Christmas salad – right? 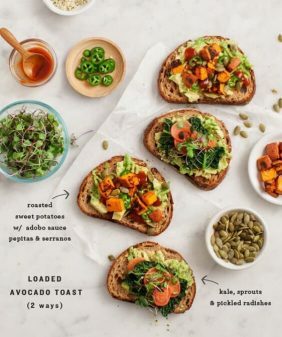 Ok, maybe not, but in between all of the cookies and other sweet treats, doesn’t it just feel so good to eat something nourishing before your next cocktail? 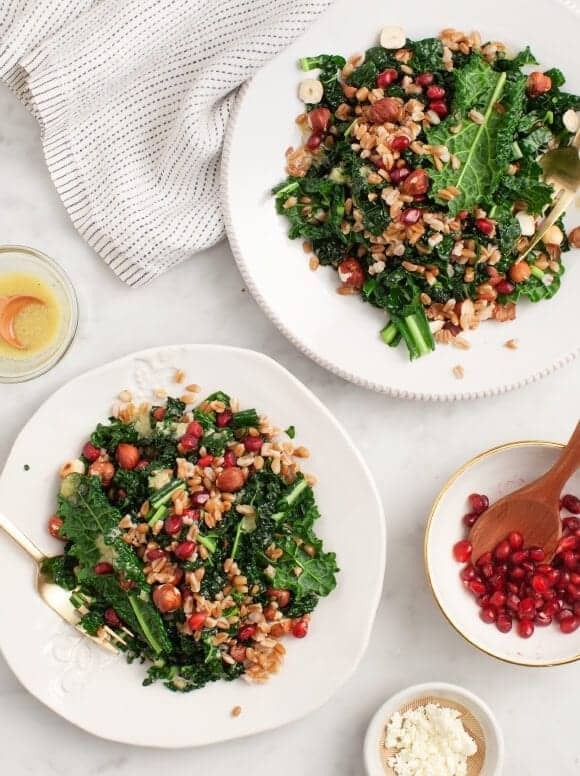 This salad is packed with so many things that I crave, like dark leafy kale and hearty farro; and to make it extra festive – hazelnuts and pomegranates. It’s the salad that looks like a Christmas tree. You can use either lacinato kale (pictured) or curly kale for this recipe. I usually find curly kale to be a little bit softer, but this pretty bouquet of local lacinato was on the smaller side so the leaves were nice and tender – especially after massaging them with this tangy dressing. 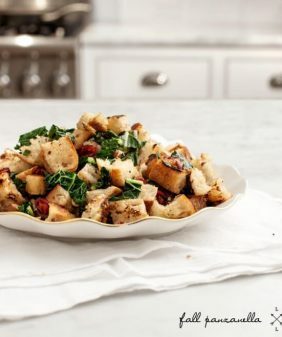 This salad looks gorgeous as a side dish on your holiday table or is delicious with soup for a cozy night in. If you want to make it a meal on its own, add your protein of choice, and pack it up for lunch during the week. It’s great the second day (and also the third). Bring a medium pot of water to a boil. Rinse the farro, then add it to the boiling water. Reduce the heat and simmer for 45 to 90 minutes, or until fork tender. Drain and set aside. 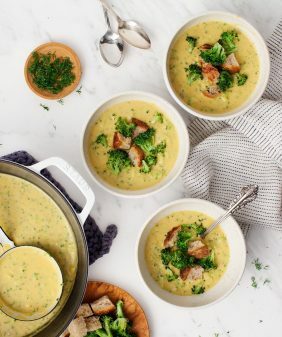 In a small bowl, make the dressing by whisking together the olive oil, apple cider vinegar, mustard, garlic, ginger, honey (or maple syrup if vegan), and a pinch of salt and pepper. (It'll taste very tangy but it'll mellow once it's tossed with the hearty kale and farro). Chop the kale into small pieces and place in a large bowl. Drizzle with ⅓ of the dressing, a squeeze of lemon, and a pinch of salt. Massage the kale until the leaves are soft and wilted. 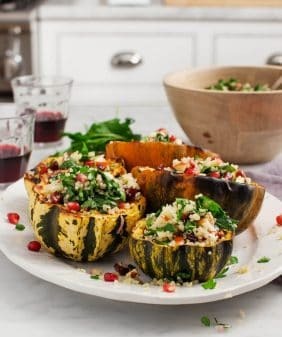 Add the cooked farro, hazelnuts, pomegranate seeds, feta, if using, and ⅓ more of the dressing. Season to taste with salt and pepper. Toss to coat and serve on plates or on a platter. Drizzle remaining dressing on top. Thanks Roxana – love farro! Ooh, I love the plates you used for this shoot! So pretty. 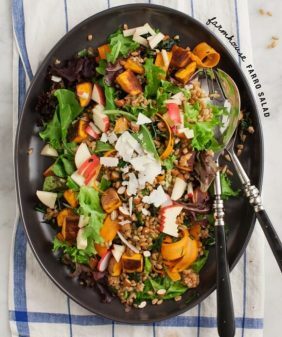 I love farro in salads – it gives a nice heartiness! Really loving all the wintry flavors in here! me too – thanks Emilie! What pretty green and red colors! All my favorite things in a salad! This is perfect for not only bringing to a party but for lunches post christmas too! Wow!! This looks so delicious!! And it is very healthy food I guess. I’ve created a superfood salad as well. Absolutely loved this salad, and it was a hit at my work party! Love the combination of ingredients, especially the hint of ginger in the dressing. Delicious! Just right for my diet! Thank you for this very healthy, hearty salad recipe! I love wintery salads, and this one looks just perfect. Merry Christmas to you guys! I love everything about this salad, especially the hint of ginger in the dressing, so yummy! I and my kids love salad. So I will try to make it. 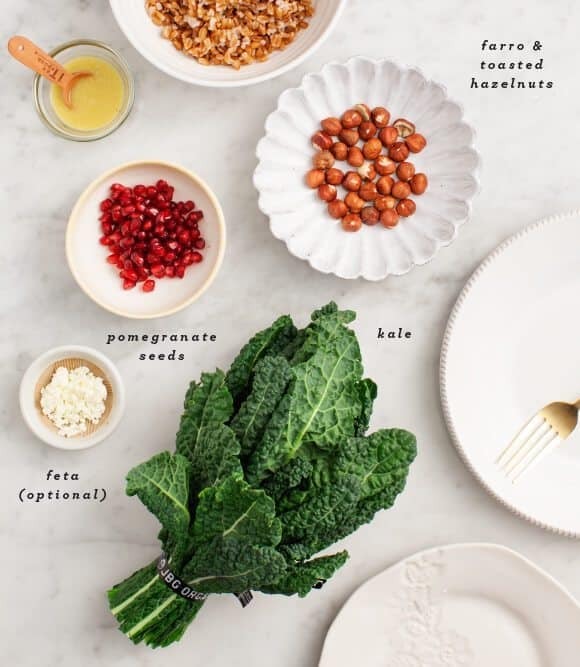 This sounds lovely 🙂 I accidentally discovered the combination of pomegranate and kale in a salad a few weeks ago, and it was a match made in heaven! 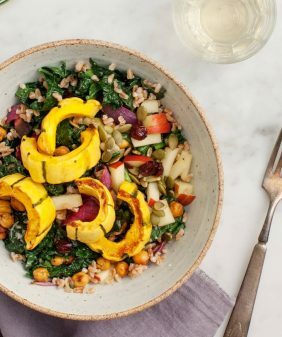 This salad is exactly what we needed on this snowy day in Colorado – I had kale, farro, and pomegranate all at the house and of course you had a recipe that fit these ingredients perfectly! The salad’s flavor combinations were fabulous and cannot wait to enjoy as a family tonight. Yay, I’m glad the recipe fit your on-hand ingredients – love it when that happens! Sending warm thoughts. Would you put the dressing on all of it it if you are going to take the leftovers to work the next day? Hi Meridyth, yep, you can put the dressing on all of, it if you like, since the kale is hearty. Hope you enjoy the salad.